Jesse Taylor is a recent graduate of the University of Michigan Law School, and a former member of the staff of the Governor of Ohio under Ted Strickland. He’s a longtime political blogger who writes at Pandagon.net. 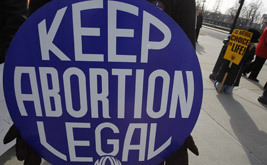 If the Supreme Court holds outrageously restrictive new abortion laws, abortion will effectively be impossible to obtain in states like Kansas and South Dakota—while technically leaving Roe on the books.